Have you been to Division/Clinton lately? Thanks to innovative eateries, private developers and the recently completed ‘Division Streetscape Project’, Division/Clinton has transformed into a vibrant destination for locals and visitors seeking an eclectic mix of renowned restaurants, unique retail and family-owned service businesses. Venture Portland sat down with the leaders of the Division/Clinton Business Association (DCBA) – newly elected President, Sydney Mead and Past President, Todd Cleek, to discuss what they love about the district and why it’s a great time to visit Division/Clinton and see who’s open for business. What are your favorite things about Division/Clinton? Sydney: What I love, is that Division/Clinton is the embodiment of a 20-minute neighborhood. I can get my work, shopping and dining needs all taken care of. It has a certain laid back, green/foodie/biker vibe. I have so many favorite businesses, it’s hard to pick just one. 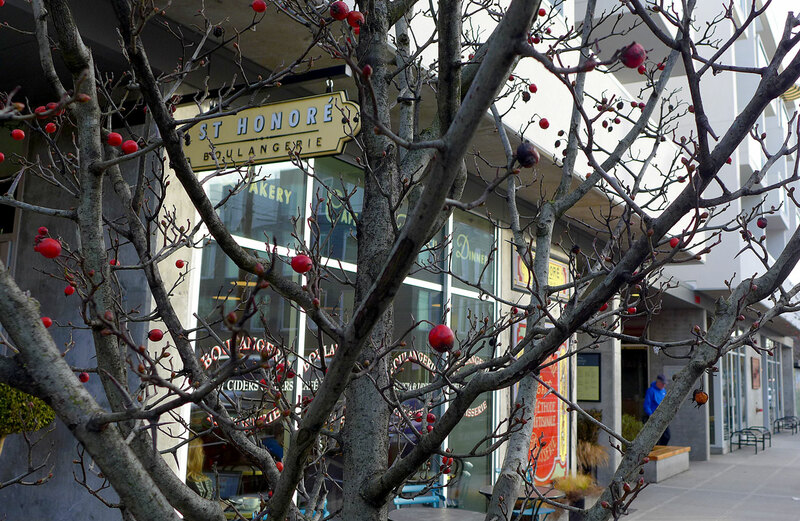 Todd: I like the proximity of living to where I work and shop – you really can walk to just about everything. There’s a lot of new commercial spaces and housing that is more traditional urban; dense, multi-unit apartments. But I live in a 3,000 square foot craftsman and it’s not unusual. This shopping center at 48th and Division is a great example of how ‘Portland’ Division/Clinton is – there’s a lingerie store [The Foundation: From Billie to Bettie], tattoo shop [New Rose], piercing studio [Nomad], motorcycle shop [Cheshire Motorsports] and vape store [The Vape Empire] across from a French bakery [Petite Provence]. That’s the cool thing, you can mix the rock and roll element with the place you can bring your grandmother for brunch. A little something for everybody. If you don’t live in the neighborhood, Division/Clinton is easily accessed by the 4, 14, and 71 busses. 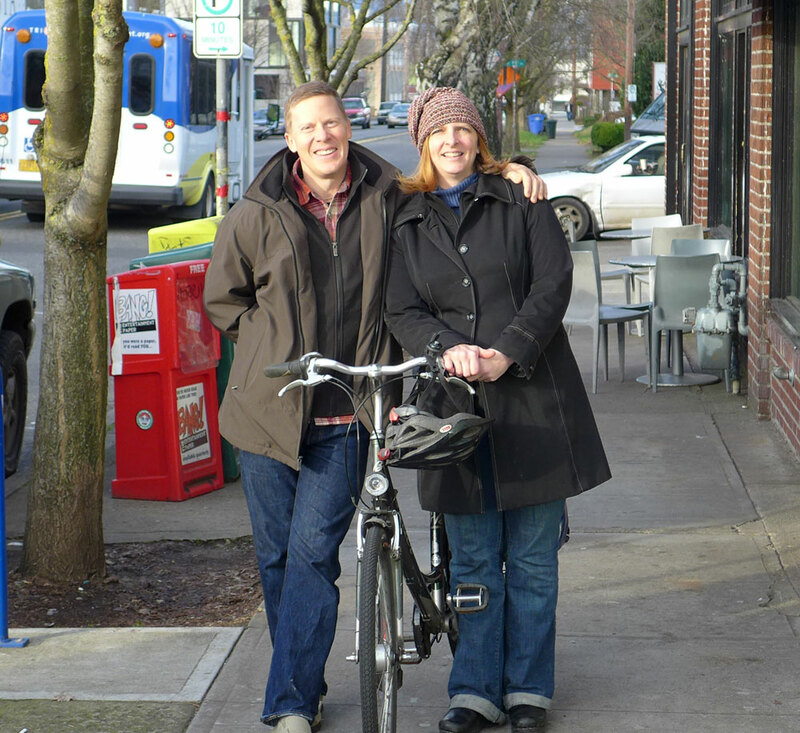 For bicyclists, SE Lincoln Street and SE Clinton Street are both city designated greenways. Trimet plans to open the MAX Orange line in September 2015 which will have a stop at SE 12th and Clinton Street. Visit trimet.org for more information. How has Division/Clinton’s identity changed over time? Todd: The Division/Clinton business mix has gone from more services and older manufacturing and warehouse space to a lot more retail and hospitality. The district is modernizing. We’ve got a lot of new ultra-modern mixed use buildings and that’s a big change. Sydney: Division/Clinton has always had pride of place. 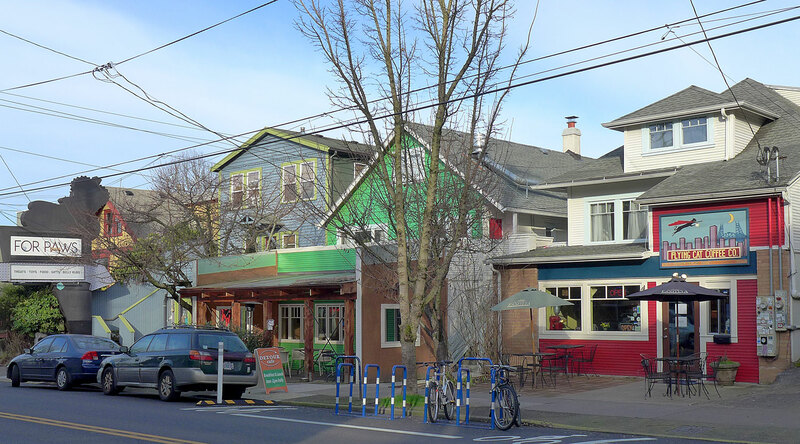 There’s a nationally recognized restaurant row [Pok Pok, Lauretta Jeans, Bollywood Theater, Stumptown Coffee] and I love checking out all these great restaurants and bars. I feel very spoiled. The growth has come with some challenges but the vibrancy that has been created is worth those hardships. Plus, the city planted 150 new trees up and down Division which I think is going to be amazing. Todd: It’s really fortunate that we had the Division Streetscape Project. It’s easy to gripe about the inconvenience of the construction but the fact that both the city and private developers chose to invest all that money – it’s a real benefit to get that kind of attention. Once a gritty collection of blue collar homes and light industry, Division/Clinton began to see change in 2003, when the now shuttered Lauro Kitchen opened its doors at 34th and Division and sparked a culinary fire that continues to burn today. How has the changing mix of businesses impacted the district? How do old and new businesses coexist? Sydney: There’s so much excitement with the new business owners and I feel like they are bringing a lot of energy and totally embracing connecting with the more established businesses. An important role that the DCBA plays is bringing the old and new businesses together so they have a big sandbox to play in. Todd: The evolution of the business mix was somewhat natural. A lot of the things that became new retail were industries that were outdated or weren’t right-sized for the district. The ones that hung around were the ones that the neighborhood needed anyway. Most of those folks were excited to have new neighbors and additional foot traffic. 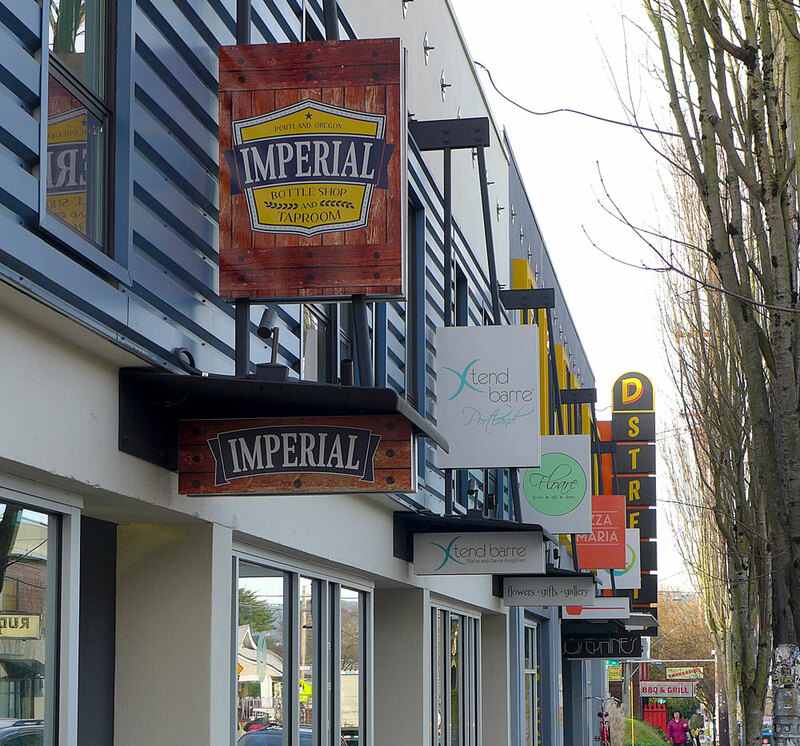 Significant investment by private developers and the recent completion of Portland Bureau of Transportation’s ‘Division Streetscape Project’ attracted an eclectic mix of unique retail and service businesses to Division/Clinton. What does it mean to be a ‘maker’ in Division/Clinton and how has this title changed over time? Todd: If you walk around the upper floors of D-Street Village the Maker Movement is really evident. Everything up there is some sort of creative business. Sydney: It is really remarkable how people are able to set up these little cottage industries. Todd: It is interesting, if you look at the street, there’s not really anything that is a Big-Box or a chain; everything is kind of artisanal. Division/Clinton is home to a variety of makers including Floare, specializing in floral and jewelry design, Langlitz Leather, makers of motorcycle leathers bags and accessories since 1947, Hollywood Impress, a union print shop specializing in business cards, flyers and postcards since 1968, Anders Printing, a traditional letterpress print shop specializing in wedding in invitations since 1946, Stumptown Coffee, the world famous coffee roaster, Eichinger Sculpture Studio, specializing in bronze sculptures of all sizes and a variety of pizza makers ranging from traditional to gourmet including Pizza Maria, Roman Candle and Cibo. What would be the soundtrack for Division/Clinton? Sydney: (laughs) I should ask my 18 year old. Todd: I would go with something off Sleater-Kinney’s “One Beat” – something a little upbeat. Sleater-Kinney, a rock band from Olympia, Washington, became a mainstay in the Portland music scene in the late 90’s. Their album ‘One Beat’ was released in 2002 to critical acclaim. What would be your perfect day of food in Division/Clinton? Sydney: I would have a cup of coffee at Good Coffee, head down to Saint Honore for something delicious for breakfast and then for lunch, my new favorite place is Pizza Maria at D-Street Village; amazing pizza. I’m super fond of Pok Pok so I would probably end the day there – I don’t know if I can highlight just those! Todd: I’m kind of old-school for breakfast so I go to Sckavone’s a lot. Their chow is fantastic and you don’t have to wait in line. For lunch, Portland Juice and then I would finish at the Hapa PDX Ramen cart on 28th Ave. That place is great; sit there by the fire and go buy your mustache wax from the retail cart. Countless innovate eateries have flocked to Division/Clinton and district-wide events such as ‘Dining on Division’ certified the business district’s reputation as a destination for foodies. In fact, Division was named one of the “10 Best Foodie Streets in America” by Food and Wine Magazine in 2013. Todd: Clinton Street Theater. People know about it but it should on everybody’s monthly go-to repertoire. Lani Jo does such a great job of curating that place and getting the most interesting films that you’ve never heard of. Sydney: I would say Josephine’s Dry Goods. It is tucked away in D-Street and you may not know it’s there and it has such an amazing selection of fabrics. Literally a hidden gem. You have to go hunt for it! Clinton Street Theater celebrates its 100th anniversary this year and is one of the oldest operating movie houses in America. It gained notoriety for its weekly midnight screenings of the ‘Rocky Horror Picture Show’. Originally located in downtown Portland, Josephine’s Dry Goods, moved to its current location in D-Street Village in 2014. The shop carries Liberty of London, Italian wools, French laces, Japanese denim, the world’s finest linens, scrumptious silks, inspiring knits and an extensive selection of luxurious fabric blends. Todd, as DCBA’s Past President, what was your favorite accomplishment? Todd: Openfest [October 2014 celebration of new businesses and street improvements on Division] really distilled it. The city was really involved in beefing up the infrastructure and giving our street a nice new facelift and celebrating that was one of my favorite things. Everybody was happy to be there. Sydney: One thing I loved about Openfest was the unveiling of the public art. 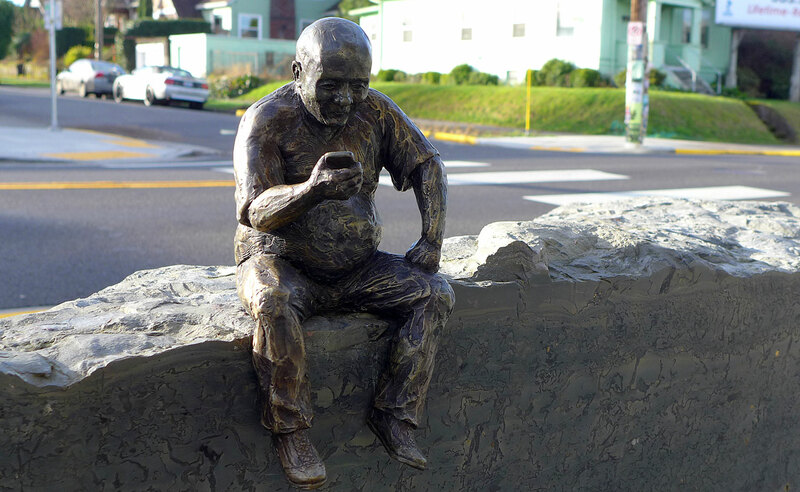 I think our public art is really fun! There are 8 locations from the Ford Building on up Division where there are these boulders with little beautiful figurines called ‘This All Happened More or Less’. They are taken from images that the artists had seen on Division. It’s a fun little walking tour especially with little kids. Sydney, as the newly elected DCBA President, what are you most excited about? Sydney: I am really excited to continue the good work that has gone before and work with the businesses to see what we can create together. I am super excited about the potential for getting involved with First Friday or additional art events. That would be amazing. I would love to see, maybe next December, some carolers, lighting – there’s just so many possibilities. Learn more about DCBA at divisionclinton.com.